–	What needs to be done to educate children to become good fathers and good mothers, especially the children in the Amazon rainforest, who have Very Poor Information and Communication Technology? –	When will you and fashion designer Isaac Mizrahi start with The Fashion Show Cycle 2? –	When can we expect your latest Album? I am awaiting Kelendria Trene Rowland’s replies. i wanna ask when we can we saw kelly in a solo TOUR?? is her new album gonna bring a huge tour? and plz pass to her that we really need to saw her in a tour. Hi I'm Val from L.A I have been a fan of Kellys since simply deep! how will she bring something new to the table with each one? 3.) What was her favorite solo performance and why? 4.) When she does a tour will she perform fan favorites like Stole and Unity? 5.) What has she learned more about herself over the last past 3 years? 6.) Does visit her fansites and forums? 7.) How must are hers opinions does she value this go round? 8.) Has she done any writing on this album? 9.) I heard she played an instrument can you ask her which one (I'm thinking it's a guitar..) and will she play the instrument for her fans one day? 10.) What song of hers is she tired of performing? 11.) what is her favorite album from her collection? 12.) will artist would she love to tour with? hi Kelly what i would like to know is being one of the most recognizable and successful dark skinned women in entertainment right now ,does she feel there is a color issue when it comes to hollywood and how will her charity I heart my girlfriends help address ra and colour issues that young girls experiene when growing up. hi kelly, being that you have literally grown up in the public spotlight and have still managed to be a good role model for women and stay scandal free what is your feeling about the new crop of artists coming out and their blatant sexual displays in their videos and songs....what do you think the younger generations will get from this stars? -Will you be doing any promotion for “Commander” in the US? style plays a lot of popularity, the video of the commander begun to look good, it must do this kind of videos, and put choreagraphies is also what makes people dance, and also look for videos love songs. 1.Please I'd love to know what you do when you have a not so great performance (maybe because of sound issues),how do you get over it? 2.If you weren't singing what would you have been doing? 4.Which direction would your second single go,dance or urban. Kelly, what is your most treasured memory lived with your fans? I think I've never seen an artist whose fans are so supportive. 1)How your first new single Commander will be release in US , with the urban remix , ore alone? 2)What will be your second single form the album??? 3)When promotion in us will begin??? How does it finally feel to actually be known as Kelly Rowland and not as Kelly Rowland from Destiny's Child? My personal favorite is 'Dilemma' with Nelly. But which one of your songs do you love most? Multi-million congratulations on what you have achieved so far and for what you will achieve in the coming years. Life is so unpreictable and being in a female group that underwent several line-up changes and had your ups and downs in your solo career has probably been your motivator to work so hard on this new album. What is your say on this? Also, Michelle seems to be doing great in Chicago (the west end). im sure you use each other for inspiration to achieve your goals in life. Ever considered theatre? Hi Kelly, When will you if you haven't by this time premiered the commander video? Also Will you be putting together some hot dance routines for previous songs with Fatima for a tour? I am always a fan. When is your next album coming out? I heard you were big in the UK. ho will you promote commander ww expecially in us??? ps: what is the name of the album??????? Can we expect a Tour after the release of your next album and if yes, can you make it to the caribbean. I live in the virgin Islands, but Puerto Rico will be close enough. I Love Love Commander !!!! Congratulations !!!! What is the one lesson you have learned from Destiny"s Child that you value until now as a solo artist? Good luck and love your songs! How many songs are gonna be on the album?? Will you be doing more club/uptempo song than ballads/mid-tempo songs?? How many songs have been confirmed for the album and what genre would they be classified as? What greatest lesson have you learnt post departure from your former manager and record label? Some people complain that you let the audience sing most of you song. Others complain that your live performances are inconsistent. While others say that you walk too much on the stage instead of dancing. Do you get these complain and if yes are there any plans to improve each live performance? I'd like to understand more about why you're supporting the 1Goal campaign. Is there a personal reason for this? can you say why education is such an important issue for you? do you think this year's football world cup will carry with it a lasting legacy to get millions of children into the education they deserve? how can we support the cause? Hello Kelly, you are one of the most talented singers of our generation yet in America you aren't recognized as such. Do you think image (skin color, ideas of beauty) still play a role in the success of American artist? P.S I always loved you and looking forward to this album, commander is fiyah! Would you be willing for Destiny´s Child to regroup? What's happening between you and Beyonce? Its obvious that you two are feuding. Hi kelly Im such a big fan and i think your fabulous. My question is we all know you as part of destinys child but who is kelly rowland? And does it bother you when people ask you about beyonce? Hi, There's dis song i love,but nt sure of da title...ehh...train on a....somethn like that and oh i luv ya new clip wit 50. What was it like being in the same group as Beyonce? Do you think she is the most talented r&b singer alive today? I love u kelly, you are the best. Love your passion for African children, it shows you have not forgotten your origin. Keep it up. hey kelly i am a huge fan of your music, i love you sooo much. 1. i just want to will you be coming out with a clothing line because your taste in fashion recently is very unique? 2. why dont you always have a huge tour in front of large audiences like Alicia keys and other female artist in the industry. 3. when will you come out with a fourth album and when will you come to sweden? Hey Kelly I love you so much! I am probably one of the biggest DC fans and I love all your solo works! You are my biggest inspiration! The question: Have you ever dreamed of recording an album full of dance music, and what genres would you like to explore further on in your career? Why every time people introduce's you they always call you a destiny's child alumni and when people talk bout beyonce they never attach's destiny's child to her,she's just beyonce.. Do you like that tag attach to your name or you think its time for people see you as jus kelly Rowland.? Why in every interview . the interviewers always ask you if u spoke to beyonce or michelle , what that have to do with the interview your doing? do you answer the question because you don't want to be rude or you answer the question because you like to? what is the title of your new album and why? Since your with a new managerment do you think they treat you better than your old management? do she believe if she was never apart of destiny's child, she would have been much more successful solo artist in america and people would never compare her to beyonce? Why wasnt Ms.kelly as successful as Simply Deep and it was a better record? Since whitney houston is her favorite singer, how do she feel about her status right now , and if she can re-sing 1 of whitney song which song it will be and why? When is the next Destiny's Child album coming out? Will Beyonce help sing on your next album? I wanted to know what made you to crossover from R@B, Pop music to dance music with David Guetta and how did you and him meet. What made you become so Popular in Europe and will there be a Destiny's Child reuion in the bright future and plus i love you new song Commander is off the Chain and i also love you. Kelly, have you ever met a celebrity that wasnt nice or that you didnt like? If so, can you tell us that story without naming the person? I have been your fan as far back as your destiny's child days, you have been my favorite. My question is; please when will the official video your new single COMMANDER come out, and when is the full album coming out? Another question I would like to ask is what are your choices for the album name and cover theme? Are you in control or does the label pick? because one good fan of yours introduce a Cleopatra theme I think that would be great for the album because Rico love said you was the Queen of the Night and you are the new Queen of Dance music and Cleopatra was the most beautiful and powerful ruler in Egyptian History, think about it its a thought. From all the drama with the replacments form Destiny's Child, the felled wedding, and the sucess of your career. Do you ever think you would write an autobiography? Or do you feel its something you and the girls, Beyonce and Michelle, must talk about or even write together from differ view points. – Did she really have a relationship with billionaire Richard Branson last year? – She starred in The Seat Filler and Freddy vs Jason, as well as some TV shows. Will she ever foray into acting again? – She recently left Music World Management, where she was managed by Mathew Knowles both as a solo artist and as part of Destiny's Child. Alot of fans feel like both her debut and sophomore albums were badly handled, with bad single choices and insufficient promotion on both sides of the Atlantic. Does she feel Mathew and/or Music World ever mishandled her as a solo artist? What was the REAL reason for her leaving his management, other than "a desire to grow and explore new things" etc? – Are she and Beyoncé blood cousins or just foster sisters? – Does she want children? – Over the years there have been a number of rumoured collaborations, including Shawwna, TI, The Script, and others, which have never materialised or surfaced. Will we ever get to hear any of them? Who would she like to work with in future? – Her debut album was an eclectic fusion of alternative R&B, Pop, Dance and rock. Her second album was a departure from that into more traditional urban material, but the biggest hit from it was the electro Freemasons Remix of the track "Work" which became a huge international hit. Since then she has had another huge international hit with "When Love Takes Over" with French DJ David Guetta, who also produced her latest single "Commander". Alot of fans feel the changes in sound were prejudicial to her career and image, and would welcome a return to the alternative fusion of sounds from her début or the straight-up R&B of her sophomore. How does she feel about that ? Does she feel she is bandwagoning in any way by switching over to the Euro-dance sound which has been dominating the charts and radio for the last four years or so? – In Destiny's Child all three girls made constant mentions of their Christian beliefs, performing at Gospel award shows and including gospel tracks on every release. Since Destiny's Child, Kelly has kept from making any mentions of her personal faith in any kind of Christian belief. Back then was it just a ploy to appeal to the Gospel market or is she truly a Christian? – What songs are on constant replay on her iPod? – She famously stated that she won a Grammy for Dance remix for "When Love Takes Over"'s remix, but apparently the award went only to the remixer and not the performer, and thus, she didn't win. Fans want to know – is she aware of this?? Lol! I would like to ask what happened to her dog CoCo? Why does she think people insist on reconnecting her to Destiny's Child and not recognize her as a solo artist? She seems truly happy and more confident than ever what helped her to get to this place? Can we expect more consistent performances because you have an incredible voice but does your nerves get to you sometimes? If you were not a singer what would you be? Can you please make it clear to reporters and interviewers alike, that your fans are only concerned with your solo projects right now. We want to hear questions that only have to do with you and no one else or any other entity? 1) What excatly motivated you to create your charity foundation "I heart my girlfriends"? 2) I assume there are a lot of charity events etc that you're asked to participate – how do you choose which things you want to get involve with? 3) Do you consider yourself a role model for young girls? Amidst all the personal drama this past year,how did you stay focused? What was it you put your mind on that didn't let you lose focus? Will there be a destiny's child reunion? 1.) What, if any training are you doing to help your live performances? 2.) When will the urban version of Commander be released? 3.) Are you still sisters with Beyonce? Will you ever date a rapper , actor or a sports person? 2) Of course, being a Kelly fan since '98, when will we, or WILL we see, a DC reunion? 1. It's evident that you are a good dancer and a veteran in the music business but why do you limit yourself to just singing and strutting across the stage like a model for the most part, when it's pretty much a fact that a solid performance will sell records? Wouldn't the incorporation of some simple yet dynamic dance routines enhance your performance? 2. You are famous for being in Destiny's Child, yet you are also 'equally' for inconsistent performances, how do you account for the latter? Anyway, I think severing ties with Matthew Knowles has been a good move for you careerwise as it has allowed or forced you to take more control of your career. After all, the only one who can determine how successful you will be, is you. Commander is a great song and the best of luck to you this time around. Pleeeeeeeeeeeeeeeaaaaaaaaaaaaaaaase don't make me wait too long for your upcoming album. Are you dating or happy to be single? Hi kelly am one of your fans down here in african,am so inlove with your song dilemma which u ftd nelly hp to see more of those good work from you. Is it still important for you as a solo artist to emphasize spirituality and feminism as you did with Destiny's Child? Hey Kelly, I absolutely looooovee your new song 'Commander'! "Do you ever think about what you've accomplished with Destiny's Child and as a solo artist, and how much successful you are?" Hi Kelly, I'm one of your biggest fans. I love you because you are really simple and down to earth. You have such an amazing voice, why dont you make records and sing as often as beyonce? Do you think you are discriminated against in hollywood because of your skin color? and is that the reason why so many artists are bleaching their body nowadays? Whatever the case I think you are amazing and believe you will go places. Really do luv u! Kelly. 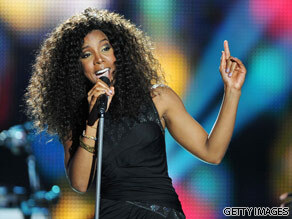 i love kelly rowland so much that i have choosen her as my favourite artiste for this year. and i will like to know her more better. kelly,l'm in ghana recently but l can hear ur voice singing everyday.l luv u very much.stay blessed. For sure I will always live to appreciate you for you're the best artist for the kind of music my hot girlfriend Joan love to listen to. I like Reggae mostly but also some R'n'Bs my sweetheart likes listening to. Congratulations for going to that extend. I will dedicate all of your love songs to my only love Joan Jepchumba who's taking her studies in Mokwo Girls High School, Eldoret Kenya. Thanks for performing and unleashing them. They make me feel her presence in her absence. I really miss and feel her when your songs go to air. Chumbaa I love you baby. Thanks a lot Rowland, you've strengten our love. I have this burning sensation from the days of Destiny's child, keep keeping it real!. 1. When do you intend coming to Africa, precisely Nigeria? 2. Can you collab with our hot acts like 2face, Dbanj and couple of them? Hi Kelly, I just want to know when you will visit Ghana. You have a huge fan base here and you are always welcome.